Your ductwork system has an important job: distributing air that has been “conditioned” (heated or cooled) by your HVAC system throughout the house so that your living space can be at the right temperature. Supply Ducts transport conditioned air from your furnace or air handler to different rooms or hallways. A separate system of Return Ductwork brings air back to the furnace or air handler to be reconditioned. In theory, a ductwork system sounds fairly basic. But there are several problems that shouldn’t be allowed to persist because of their adverse effects on your comfort, health and utility costs. Leaky ducts are very common and can diminish the efficiency of your HVAC system by as much as 40%. It doesn’t make sense for air that you’ve paid to heat or cool to leak into an attic, basement or crawl space through gaps and cracks in your supply ducts. And it’s not healthy to breathe crawl space or attic air that’s sucked into leaky return ducts and then circulated back to your living space. Fortunately, these problems can be corrected by sealing your ductwork system. Uninsulated or poorly insulated ducts waste a tremendous amount of energy. Just think about what happens in the winter, when your HVAC system is blowing heated air through uninsulated ducts located in a frigid attic! 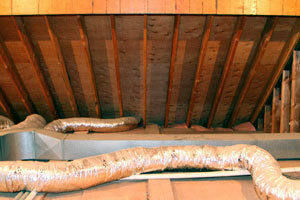 Before your HVAC system can heat your living space, it must first heat up the attic ductwork. In the summer, you’re blowing chilled air through the same uninsulated ductwork, that’s been heated to about 120 degrees. Imbalanced ductwork wastes energy while also creating areas in your house that are too hot or too cold. Balance problems occur when the amount of air delivered through supply ducts doesn’t match the amount of air drawn in through your return ducts. This typically occurs because of improper location and size of supply and return ducts. Oliver helps homeowners save energy! From duct cleaning and maintenance, we do it all! Up to 40% of the energy usage of your HVAC system could be wasted by duct leakage. It’s extremely important that you include ductwork testing and evaluationin your home energy checkup. For a Free Ductwork Estimate to assess your home’s ductwork energy efficiency and to see if air duct sealing will work for you, call or contact us online. Start saving energy and money with a ductwork system upgrades today. Call 1-877-757-1141 today or contact us online for a free home energy audit and heating and cooling estimate.